Fat grafting is a procedure in which fat is harvested from one area of the body and transferred to another. The injected fat cells survive by establishing blood flow from their new environment. This gives fat the advantage of being a potential permanent filler. Fat grafting to the face is performed to replace or enhance volume. Fat loss is believed to be one of the principal causes of facial hallowing and aging. This contributes to the unmasking and deepening of facial lines and grooves. Fat grafting to the face has to be done meticulously in small volumes and to certain areas. It can be performed separately or combined with other facial procedures like facelift and lower eyelid lift. Hypoallergenic. Because fat grafting only uses your own body fat, the procedure is completely hypoallergenic. This eliminates some of the risks and potential complications that are associated with other fillers, including the possibility of an allergic reaction. Minimally invasive. All surgical procedures involve incisions and scars. However, the injection points used for fat grafting are minimal and much smaller in comparison to the incisions necessary for placing breast or facial implants. Liposuction incisions are also very small and strategically placed for minimal visibility. Natural-looking results. Many patients are hesitant to have implants placed because they are afraid that their results will look artificial and unnatural. Rest assured that Dr. Alghoul is a skilled and talented plastic surgeon who has helped hundreds of implant patients achieve beautiful yet natural-looking results. This being said, if natural-looking and discrete results are your main priority, Dr. Alghoul may recommend you combine fat grafting with an implant procedure. Fat grafting produces results that feel and look natural because only your own fat is injected into your body. Quick results. People with multiple problem areas can enjoy faster results from fat grafting. With multiple procedures, you must wait until you are healed from the first procedure before undergoing the next. Imagine achieving a slimmer abdomen and fuller, youthful face — at the same time! 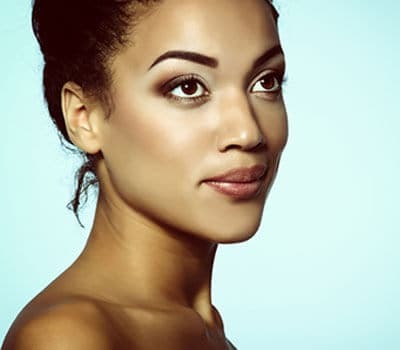 While fat grafting is indicated for facial volume enhancement in areas where fat is naturally present, facial implants are used to augment the face in areas where bone projection is lacking. Dr. Mohammed Alghoul uses porous surgical implants to augment the chin and bony rim under the eye. Some patients have lack of bony support under the eyes, which makes them more prone to having prominent eyes and accentuates the appearance of bags and grooves under the eye. Using specialized facial implants that are specifically designed for placement under the eye provides additional support for the soft tissue and reduces the perception of prominent eyes. The implants are placed through incisions that are hidden under the lash line or on the inside of the eyelid. If you’d like to schedule a consultation with Dr. Alghoul to discuss facial fat grafting or facial implants, please call (312) 695-3654 or contact us via email.